My tail may say Yes yes, but my lips say No no! 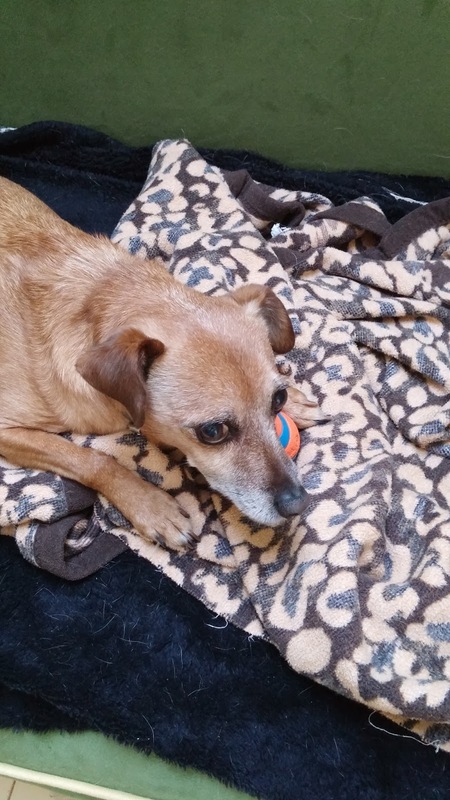 Jack takes ball guarding seriously. 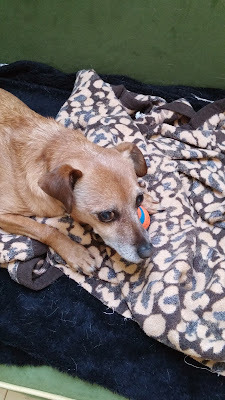 Now I can get very stern and he'll let his ball go grudgingly, if I don't he holds and growls complete with lip action and steely glare. The tail wags but in all honesty, he just wants to keep his prize and I can respect that in a house where toys are shared among 7 other siblings. We're talking terriers here, not Golden Retrievers. So leaving the growly dog lie, we can move on to the latest sewing make. A Merchant & Mills Top 64 which is perfect for showcasing some handwoven fabric. This is a tried and true pattern for me. I certainly wasn't going to waste my wee bit of woven cloth on a pattern I hadn't fully tested and adjusted. I'm pretty pleased with the outcome. This will get a lot of wear and why shouldn't it? 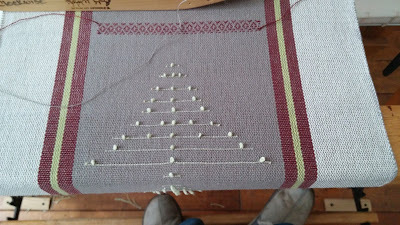 Everything is serged and top stitched. I had originally bought a piece of silk/linen fabric, but the shine from the silk bothered me with this piece. This cotton blend damask fabric had a better weight and surface. 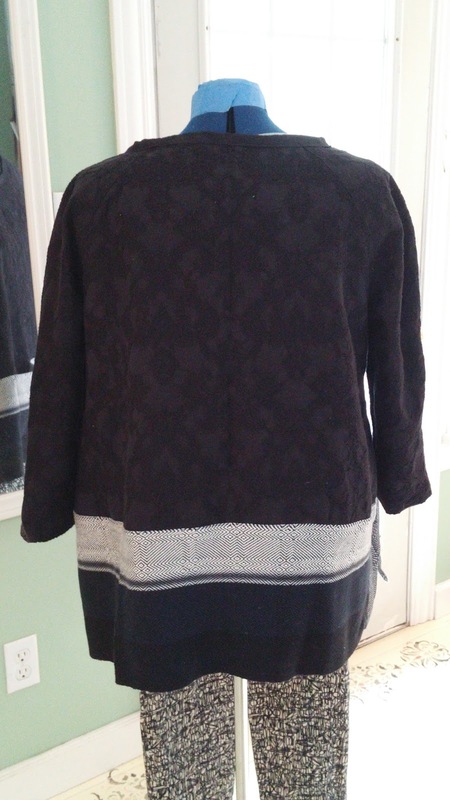 I like the matte of it and the patterning works well with the twill. Jack, the one and only photo bomber! With ball! I did not hem this fabric since the lower edge is the selvage and they were pretty nice on this piece, but I did do split side seams since they did not match due to the way the pattern curves the hem. It worked well and added another level of interest to the garments. 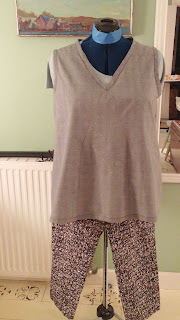 Before we leave the sewing salon there is one more make, a cami top using the modified Mississippi Ave dress. This was a save from another pattern cut. I didn't like the way it was going together and decided to save it all by re cutting this beautiful cotton shirting into the Miss. Ave top. I wear these little cotton tops under everything in the winter and in summer of course they are sheer and cool. There are some new patterns being cut and tested. Next post I'll have at least one done and can give a thumbs up or down. In the studio I'm still playing on Nora's warp. I had a lot of fun with these flowers. 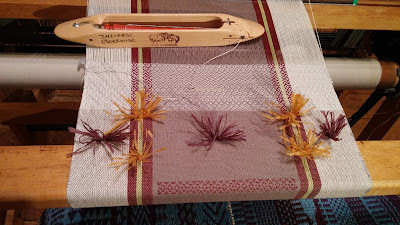 The fiber is a linen paper ( shifu ) from Habu and on one of the test lengths I am planning to weave with it in a towel and see how it holds up. Why not? I did a little inlay and then I wanted to see what plain weave inlay did on the rose path background. Not much, don't bother with this. 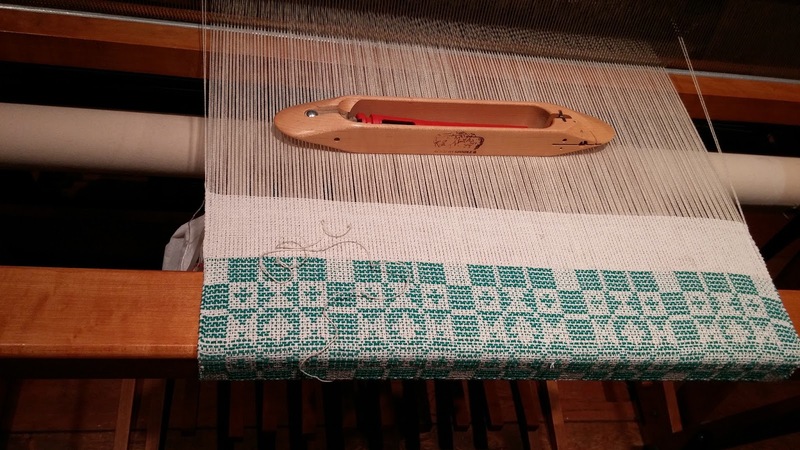 Once this warp is off, a special warp is going on. This will be an open threading to make loose lacy squares. I want to do the paper flowers but in the warp I want to use some beautiful Habu stainless steel and linen thread I've been saving. Nick broke Monday afternoon right after I started weaving my quilt squares summer and winter towels. but he's up and running. Thank you Gene, you are a real loom saver! I saw the fox last night, he was getting his eggs. The mate was waiting out in the shadows of the driveway. It's that time of year. I believe he shares. They were two dark figures against the white snow trotting off together for a nights adventure. And more snow today! And then there is the raccoon. Now I was worried about her with all the snow we had. That was until I went into the tack room one morning and undid the bungied lid to the grain bucket and there she was, trapped inside. Scared the bejeebers out of both of us. I left the lid off and backed out of the tack room and waited while she scurried out. Tracks tell me she has been a regular visitor now to the barn and got caught a second time in the grain bin. I heard her this time and was ready. I also banged on the side of the barrel to scare her. We have beefed up bin security. No repeat performance so far. Raccoons are too dang smart for their own good! Parting shot: Dear sweet Smoochie. 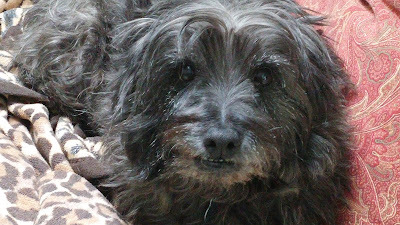 He's our resident senior now at 14. The Mad Bomber Jack's Timmy is very nice and I can see why he wants to protect from fellow thieves. Love your new top with the handwoven fabric, very pretty! Smoochie has the sweetest little smile. Smoochie does look as sweet as all get out. 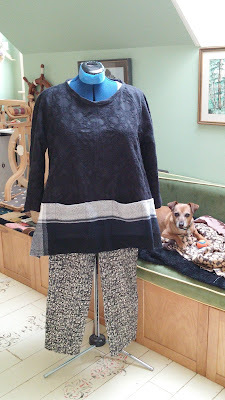 I, too, love the handwoven top! Did you weave the upper fabric as well as the hem/bottom border fabric? Either way, looks smashing! LOVE that top! And, with your handwoven panel to make it even more special! Did you add a bit to your pockets??? I want to make an adjustment to my pattern, I think. Be careful with that raccoon...they can be nasty if they feel cornered! LA, yes, I added depth to the pockets. I think about 2 inches is the usual modification. I had to piece the pocket on the handwoven side. I have the utmost respect for our resident raccoons, but they are much more fearful of humans than urban or even suburban ones. She has a hide hole up by the ceiling she dives for in a pinch and waits for me to leave. 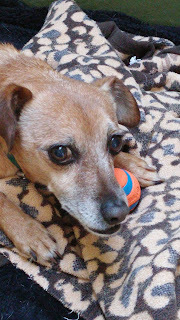 Peg, Smoochie is the most unterrier like of the bunch, he is sweet with every animal under the sun. I did not weave the upper portion of the top. Well beyond my capabilities to do so I would think both skill and equipment wise.But someone made that beautiful fabric! Thank you! Martha, Until I started taking pics of things for the blog, I never realized what a clinger he is. They all are. Smoochie is always smiling too, what a happy dog he is. 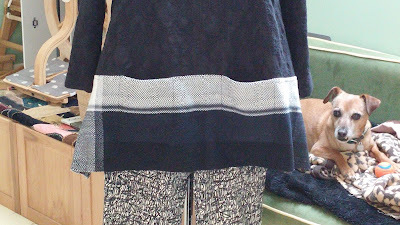 Fantastic tops and pants, and the handwoven one is smashing! Smoochie is a gentle dear and Jack is still guarding in the last pic. :-) My little fella is limping along-I'll send you a note with particulars. Your wardrobe must be amazing! I love the use of handwoven fabric in that top. Beautiful! Leigh, No, of course not. She'll be back but she'll have a hard time getting into the tack room. The cat access is blocked overnight until I unblock it at 5 is in the morning. Mary, Pets to LIttle Nick and good to hear from you.